You can sweeten the deal on a Honda Civic by purchasing a used Civic instead of a new one. This aerodynamic, tech-filled compact sedan comes with all the great features of a new Civic but at an even more affordable price! Come explore our selection of used Honda Civics at Manly Honda in Santa Rosa, CA, serving Sebastopol, Sonoma, Petaluma and Rohnert Park. Let us show you how simple it is to drive off in a fantastic used Honda Civic today! It makes so much sense to purchase a used Honda Civic because it's fuel-saving, fun to drive and big on amenities. 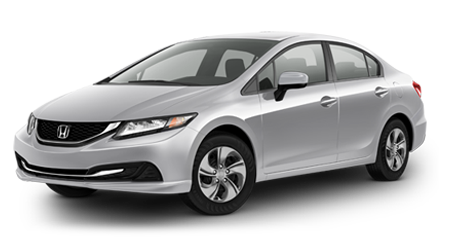 You'll find robust Inline 4-cylinder engine with manual or automatic transmission, ABS brakes, power mirrors, air conditioning, an AM/FM/CD/MP3 stereo system, power windows and door locks, storage in the seats, remote keyless entry, tilt steering wheel, a theft-deterrent system -- and that's just on a base used Civic! Consider buying a Certified Pre-Owned (CPO) Civic from Manly Honda because you'll get even more peace of mind with your purchase. To qualify for the program, a used Honda Civic must be 6 model years old or newer and have less than 80,000 odometer miles. It then must pass a rigorous 150-point inspection performed by factory-trained technicians, and a CARFAX history report which reveals any damages, repair, or accidents must accompany the vehicle. Another added plus is that a CPO Honda Civic is backed by an incredible warranty, including a 12-month/12,0000-mile extension of the New Car warranty and a 7-year/100,000-mile powertrain limited warranty with $0 deductible for covered repairs. For more reassurance, you can buy Honda Care Certified Additional Coverage, which extends the powertrain warranty to 8-years/120,000 miles and includes more vehicle systems coverage and roadside assistance. And if your CPO Civic is equipped with satellite radio, you'll get a free 3-month subscription to SiriusXM. It's simple to get pre-approved for a used Civic at Manly Honda. On our website, just fill out a four-step application, and you'll be contacted about what financing options are available based on your credit. Don't fret if your credit isn't perfect because our finance department works with multiple lenders, and we'll try hard to get you into the used Honda Civic you desire. You'll find the used Honda Civic you've been pining after at Manly Honda, serving Petaluma, Sebastopol, Sonoma and Rohnert Park. So let one of our sales associates take you for a spin in one, and let's sign the paperwork this afternoon!